These letters deliver the same mix of the heartfelt, the historically significant, the tragic, the comic and the unexpected. Discover Richard Burton´s farewell note to Elizabeth Taylor, Helen Keller´s letter to The New York Symphony Orchestra about ´hearing´ their concert through her fingers, the final missives from a doomed Japan Airlines flight in 1985, David Bowie´s response to his first piece of fan mail from America and even Albus Dumbledore writing to a reader applying for the position of Defence Against the Dark Arts Professor at Hogwarts. Jane Austen, Richard Burton, Helen Keller, Alan Turing, Albus Dumbledore, Eleanor Roosevelt, Henry James, Sylvia Plath, John Lennon, Gerald Durrell, Janis Joplin, Wolfgang Amadeus Mozart, Janis Joplin, Hunter S. Thompson, C. G. Jung, Katherine Mansfield, Marge Simpson, David Bowie, Dorothy Parker, Buckminster Fuller, Beatrix Potter, Che Guevara, Evelyn Waugh, Charlotte Bront‰ and many more. Shaun Usher is a writer and sole custodian of the popular blogs www.lettersofnote.com and www.listsofnote.com. He has transformed both blogs into the bestselling books Letters of Note, More Letters of Note and Lists of Note, crowd-funded by Unbound and jointly published by Unbound and Canongate. He lives in Wilmslow with his wife Karina and their two sons. Shaun Usher is a writer and sole custodian of the popular blogs www.lettersofnote.com and www.listsofnote.com. He has transformed both blogs into bestselling books, crowd-funded by Unbound and jointly published by Unbound and Canongate. He lives in Wilmslow with his wife Karina and their two sons. 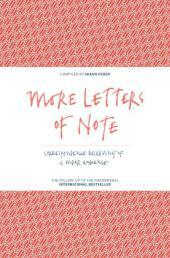 He is the author of the bestselling Letters of Note, More Letters of Note and Lists of Note.